Lunches are tough to plan for the week, not to mention actually prep and cook. It can be hard to find the motivation some Sunday’s to spend time in the kitchen making food for the work week instead of enjoying the last few hours of the workday. This past week, I was feeling especially uninspired. Just what you want to hear at the beginning of a recipe post. I had already made Basil Quinoa and Chickpea Salad with Tahini Dressing, Healthy Buffalo Chicken Bites, Slow Cooker Avocado Chicken Salad, and Spicy Soy Sauce Basil Chicken, I was running out of ideas, to be honest. Then hit it me, I remembered a simple classic from my childhood – BBQ chicken with rice. I had BBQ chicken and rice every night throughout middle school and high school. Okay, not every night, but once a week easy. The idea made me excited to whip up my own version. When revisiting this childhood classic I wanted to keep it easy and simple, and nothing is easier than the slow cooker. You could make BBQ chicken with two ingredients – BBQ sauce and chicken. 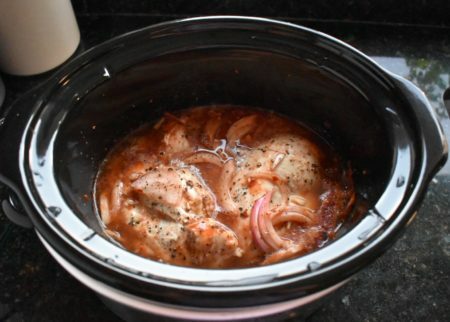 I was looking for something a bit more flavorful, so I added some onion, garlic and vinegar to the slow cooker to spice up this Easy Slow Cooker BBQ Chicken while still keeping the recipe simple with only 5 ingredients. Besides a knife, that is really all you need to make this recipe. This recipe is really easy to make too – it only has a few steps to it. Add all the ingredients to the slow cooker and set it for 4 hours (or your desired setting). Come back and shred the chicken with two forks after the set time has passed. The sauce will be cooked down and extra “liquidy” at this point. If you are storing some of the chicken in the refrigerator, save some of BBQ sauce from the crockpot to keep the chicken moist, then dump whatever you didn’t utilize. I also like to add fresh BBQ sauce (from the bottle or homemade) on top of the chicken before serving. As you can see, I’m not a fan of sauce-laden meals. Just a little sauce gets the job done for me, but you can customize this recipe however you want. Just remember, the extra sauce will add a little it of sugar and calories to the nutrition profile. The sugar content was actually lower than expected in this one. Sugar is usually a pretty big red flag for me, and since BBQ typically has a decent amount of sugar in it I thought we might be in some trouble here. Six grams though is not too bad, in my opinion. The total is $17.86. That breaks down to $2.23 per quarter pound serving. This Easy Slow Cooker BBQ Chicken has only 5 ingredients but packs big flavor. It makes a perfect weekday lunch. 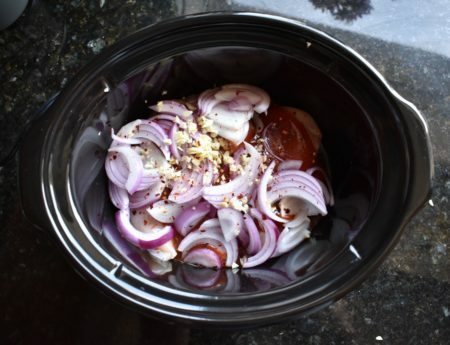 Add the BBQ sauce, vinegar and chicken to the slow cooker. Finely chop the garlic and cut the red onion into thin slices. Add both to the slow cooker as well with salt and pepper. Top the chicken with fresh BBQ sauce and enjoy! 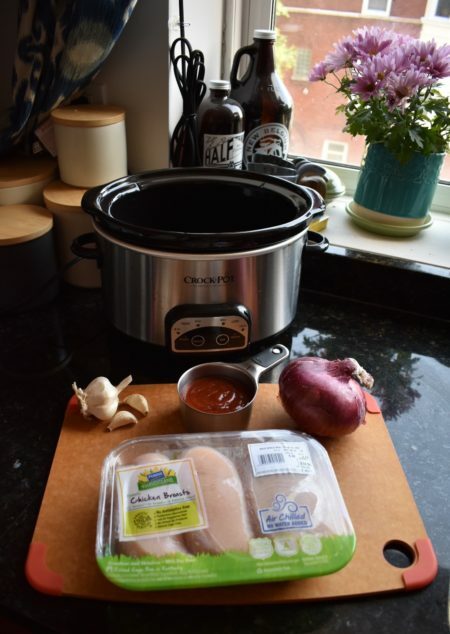 I hope you enjoy this Easy Slow Cooker BBQ Chicken! This chicken does sound like a very good lunch: easy and tasty. Exactly! The beauty is in the simplicity. Thanks Jeff.